The Truth Behind The Alleged 1.5 Lakh Invite Of Mukesh Ambani's Eldest Son Akash! The card is made of 18 carat gold! It's the wedding of the eldest son of richest man in India (perhaps even the world) and of course, everything would be nothing less than spectacular. 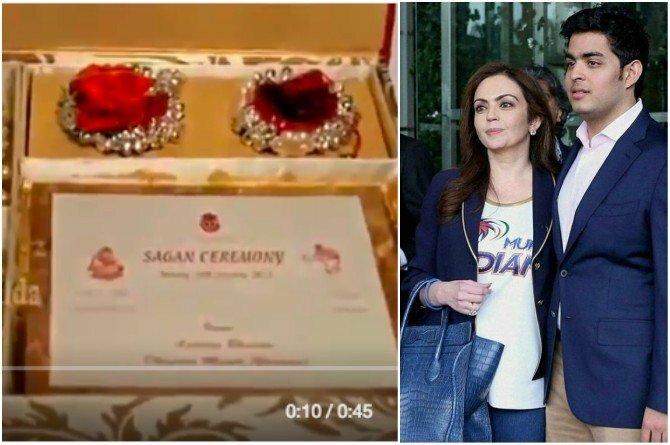 Akash Ambani, son of Reliance group chairman Mukesh Ambani, is all set to wed in the coming weeks and his wedding card is made of Gold. Yes, that's right! The invitation card took the social media by storm yesterday and is said to be priced at Rs 1.5 lakhs. The card is not from the Ambanis! However, today morning Reliance industries confirmed that the card that was being circulated was a hoax and not that of the Ambani scion. The Reliance Group itself came out and clarified that the card which was going viral on social media, was not of Akash’s wedding, says a news report in Times Now. Whatever it is, the card is indeed worth a look. Check it out and tell us what you feel about it! Read: Gali Janardhan Reddy's daughter wore diamonds worth 98 crores at her wedding! Is Madhubala star Drashti Dhami pregnant? Man kills pregnant wife and locks up 4-year-old daughter for THIS reason!